A true Founding Father of English Karate, it was at this time of the year in 1963 – that’s 40 years ago – that Mick Randall and Ray Fuller decided to join the first Karate Club in Great Britain run by Vernon Bell. That 40 years of service to Traditional English Karate has earned Mick an MBE. He trained under the first visiting Japanese Instructors like Tetsuji Murakami and Hiroo Mochizuki, featured in the first colour film of Karate in England in 1964 that was shown in cinemas all over England and took part in the first JKA Karate demonstrations in England supporting Sensei’s Kase, Kanazawa, Enoeda and Shirai. Mick was a founder member of the Karate Union of Great Britain and one of the first to be awarded a JKA Black Belt. He is the subject of the book “The Kanazawa Years” written by prolific Martial Arts Author Clive Layton. His life in Karate is an interesting story with 40 years of continuous training and study in the Art of Shotokan Karatedo with Instructors that have become legends over the years. 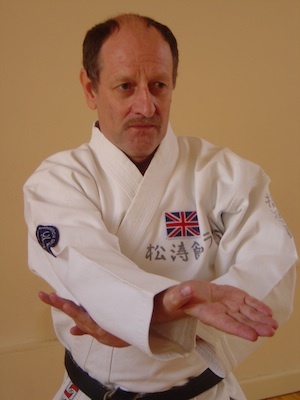 Mick is a stalwart of the English Karate Governing Body that he founded the roots of 4 decades ago…. SR Hi Mick, first of all let me congratulate you on recently receiving the MBE! MR Thank you Steve, it’s an honour for all of Traditional Karate and a great honour for me. SR Can we start by taking a look at your background before you started Karate? MR I was born in Stoke Newington, North London and grew up mainly in London, after I left school I had numerous jobs because to be honest, I was lazy and didn’t really want to work! My Dad made me sign up as an apprentice carpenter and that was where I met Ray Fuller. Ray had been in the army previously and had seen Karate in the far east and had bought Nishiyama and Brown’s book “Karate the Art of the Empty Hand” he asked me if I wanted to learn Karate. We got on well together so we decided have a go! MR There was only one club in London at the time and that was run by Vernon Bell. MR In December ’63 we had to apply in writing with a fee of ten shillings, (50p) he sent us a stack of reading material and forms to fill in and by the time we’d done that we started in January ’64. SR How old were you then? MR I was nineteen years old and Ray was ten years older. He was a very fit and strong man! SR What was the first class like? MR It was over the Horseshoe pub in Clerkenwell Close in the East End of London. We actually went on Rays motorbike, I remember it was freezing! Vernon Bell made us watch twice before he would let us start! He was very strict. I think he did everything he could to put us off… The club was a part of the Yoseikan group and the training was like “old style” Shotokan. The training was very hard and repetitious, but we were all young and fit and could take it. MR Oh yeah! Ray Fuller and I used to train together whenever we could at work, we used to get up to all manner of strange things! We were on the roof of a building practising Kata… I think it was Heian Shodan and sparring when one of the nurses in the hospital across the road (never having seen Karate before) called the police because she must have thought we were mad! We used to take a Makiwara up to Epping Forest in Rays sidecar, plant it and then hit it for hours before bringing it all the way back again! SR Who else was around at that time? MR Jimmy Neal and Terry Wingrove did most of the teaching, there was Brian Hammond, Arthur Nightingale, John Chisolm, Rob Williams, the late Eddie Witcher, Brian Harper, Pauline Laville (now Bindra) and Royston Merrick. SR How did you get introduced to the first Japanese Instructors? MR About a month after I started training Vernon Bell invited Hiroo Mochizuki over and I was very impressed with him! He was a very well educated and cultured man and spoke French so Vernon Bell and Terry Wingrove were able to translate. When Tetsuji Murakami came over he was different, a bit “gangster” like, he had a prominent gold tooth when he smiled and scared me a little as he had a reputation for giving out a “slap” or two, but he was also good for a laugh. He also spoke French. When the JKA Japanese came over they made us lower our stances and changed us to what we all know now as modern Shotokan. SR How did the JKA Japanese Instructors get invited over? MR Vernon bell was the only Black Belt in England, then a guy called Bobby Bolton came back from Japan as a Black Belt in Kyokushinkai and was claiming to be the only Black Belt in England, Vernon made him retract that statement. Then Tatsuo Suzuki (Wado Ryu) came over and he was a 5th Dan, Vernon couldn’t compete with him and decided to contact the JKA and bring the Japanese Instructors over. They sent Kase, Kanazawa, Enoeda and Shirai, they did a demonstration in London and Kanazawa stayed and Kase went to France, Enoeda to South Africa and Shirai to Italy. SR The training must have changed quite dramatically with Kanazawa? MR It certainly did! He was a gentleman, he would say “very good, but lower stances, more hips” his own standard was so good, he had been World Champion twice by then. The main differences were the stances, use of the hips and breathing and Kanazawa Sensei was very careful to make sure that we fully understood in great detail what he required from us. His training was hard, basic and meticulous, but it gave me a good foundation for the rest of my life. MR All those who were senior to me when I started have either died or left Karate. There was the late Eddie Witcher, Terry Wingrove and Jimmy Neil. Terry and Jimmy were Brown belts and did most of the teaching. When Jimmy got his Black Belt he stopped training and Terry went to Japan and stayed for over 20 years. Having said that I bumped into Terry for the first time in 38 years in the Japan Centre in London a couple of weeks ago! He had a couple of copies of the book “Shotokan Dawn” in his hand and I was behind him and said “excuse me…. I’m in that book” when he turned around we both instantly recognised each other! He’s got a fantastic memory, he rattled off the names of all the people that were in my first lesson! SR When did you take your Black Belt? MR January 6th 1967. You’ll notice on the certificate it gives the date that the certificate was written, but that’s not the date I passed the grading. I think I was about the third or fourth person in London to get a Black Belt. SR Was it a hard grading? MR Not technically hard, but it was a very physical grading! Then Kanazawa left for Germany and Enoeda came down to London, Kanazawa, formed the SKI and I received the very first licence, you’ll see it’s numbered No. 1! SR Who were Kanazawa’s Seven Samurai? MR Oh there were the seven of us that used to follow Sensei around, we had a badge made that he said we should wear on our Karate blazer, the seven were… Kanazawa Sensei, Eddie Witcher, Mick Peachey, Will Mannion, Nick and Chris Adamou and myself. We used to train and socialise together, often having meals at Chinese Restaurants with visiting Japanese, as there wasn’t any Japanese Restaurants around in those days. SR When did you go to Japan? The whole trip was a learning experience because at that time everything was so different! SR How do you feel Karate has changed? MR In the old days we trained with all young fit men and it was very demanding physically, now…. we are far more technical and cater for a wide range of people. There is no bullying now either – we encourage people far more, so it’s changed considerably. Western people get bored far easier, Eastern people tend to just do as they’re told. I now sit down and try to work out interesting lesson plans for my students. SR Have you ever cross trained at all? MR No not really, I’ve learned a couple of Goju Ryu Katas and did a bit of Tai Chi with Kanazawa, but I’ve stuck to Shotokan really…. SR How were you informed that you’d been awarded the MBE? MR It’s a funny story really, I received a phone call from Downing Street and I thought it was someone playing a joke! They said that I hadn’t replied to their letter from a fortnight previously, I said that I didn’t have clue as to what they were talking about! They said that I’d been offered the MBE and they wanted to know if I was going to accept it! They faxed a copy letter to me and I signed it and sent it back. When my Father was moving some of my piles of papers around a little while later, the original letter fell out from the middle! I must have just got it mixed up with them! SR How did you feel when it was announced? MR I was overwhelmed! Not just for me but for Traditional Karate as a whole. Many people still don’t realise the positive effect that Traditional Karate has on our society, it involves a lot of good manners, etiquette and respect and does make the practitioner a better person. This award helps to add respectability to Karate as a whole. People I meet now look at the Art a little bit differently because of the award. SR How do you see your future? MR I just want to continue teaching and turning out good, well mannered and skilled Black belts for as long as possible. I love having all my friends around me and those like Mike here (Mike Nursey 7th Dan), that have been around me for many years. I have renewed my friendship with Kanazawa Sensei and he now treats me more as a friend and equal when we meet, I find that very rewarding. SR How do you feel about the development of the English Karate Governing Body? MR It’s been a long time coming. Since the early days I haven’t really been that involved in the Governing side of things, but it is good to see everyone finally getting their act together and evolving a Body that’s active in it’s support of Karateka everywhere. It’s good to see so many of the Founding Fathers sitting around the table, people from my early days like Mike Nursey and Mick Billman – people I know I can trust…. How can karate be related to the philosophy of the future like seeing yourself being a child again and freeing your mind or looking into the past and searching for the idea in how JFK saw our reality or how some of the greatest minds in the world have seen who we are today, computers, theories of the universe and electronics and how they shape our world. Next Next post: Internal Or External?